Is there a difference in behaviour and motivation in different age groups? 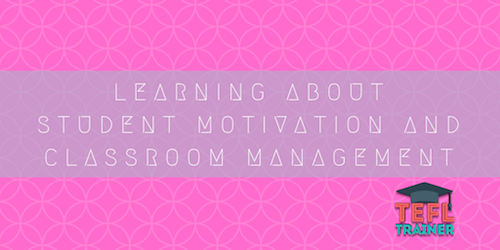 Keeping a student motivated in the classroom is, in my opinion, one of the utmost important skills when it comes to being a teacher. Since starting my internship in September, I have found that to get the most out of your students, you need to familiarise yourself to their needs and influence your behaviour to make them feel comfortable and confident. In this way keeping a student interested and managing your students are very closely related. Most of my classes are 1 to 1 and I have a few which are 2 to 1 and consequently have had challenges that I have had to conquer during the last few months and have tested my skills to manage the classroom. For me to create a positive atmosphere, I will start the lesson by involving the student with some small talk, because I believe this gives me the opportunity to get to know the student and what skills they have. I also use this time to introduce myself and make the student feel as comfortable as possible no matter how shy, nervous, eager they are. Allowing them to put across their opinions, has allowed them to speak more easily, given the fact that the information is established and organised in their head. I also strongly believe that by engaging my opinions with the student can also motivate the student even more. To my awareness, this method has been incredibly effective, and students have frequently asked for lessons solely with me, especially those aspiring to take their English from B2 to C1 or even to C2 which are mainly young adults getting ready to go abroad or adults needing this certificate for a job. However, I would be lying if I said that I have not faced any challenges and I will clarify this by using 2 examples. If I am teaching a child for example, I will balance out my character and personality as my attitude with adults can sometimes be miss interpreted by children. They can see my behaviour as a reason not to listen to my instructions as my personality is fun and content. Most of the children that I teach, have very little concentration and motivation in class, and can sometimes be extremely difficult to engage them in the tasks that they have been set to do. A case study for this would be one particular student I often teach only fully engages with the lesson when we do activities and games in order to learn new vocabulary and grammar, hence the reason for my personality to be more fun and exciting around children. On the other hand, if I am teaching an adult who is getting ready for an exam or a job interview, this can be very interesting. If the student is prepared, they are very motivated, and they have a positive behaviour as they are willing to learn more vocabulary, they want to make sure the grammar is correct, and they are always eager to take on advice from their teacher who is a native speaker of English. Taking both age groups into consideration, I would say that the younger age category lacks concentration and motivation is class therefore their behaviour can sometimes be silly and careless, whereas an older more mature student, has the attitude to improve their skills and therefore their behaviour and motivation is more proficient.